The Outer Forces of Heaven are manifested through the Three Treasures: the combined energy field of the sun, moon, and stars. The sun and moon are the primary Heavenly manifestations of Yin and Yang Qi. The sun is Yang and is considered the Spirit Soul (Hun) of Heaven, while the moon is Yin and is considered the Corporeal Soul of Earth. The sun and moon cyclically change their relative degrees of Yin to Yang at different times of the day, month and year. These changes affect the Earthly Yin and Yang energies as well as the Qi in the body. The most easily observed changes in the stars’ energy, which affect life on Earth, are from the North Star, the Big Dipper, and the 28 constellations. Stars’ energy will be discussed in Part 5. Some of the Five Elements’ correspondences between Heaven’s Treasures and the environment of Earth appear in Table1. The body’s biorhythms are influenced by the cyclic energy changes of the sun, moon, and stars. For example, certain hormones, temperature, blood pressure, blood amino acids, etc. exhibit a cyclical variation during the day; women’s emotional and menstrual cycles, usually 28 days, follow the changing phases of the moon. The Physical Cycle is 23 days long. The first 11 ½ days produce an increasing feeling of good strength and endurance, while the second 11 ½ days produces a decreasing feeling of strength and endurance. The Intellectual Cycle of 33 days has similar properties with the positive half being the first 16 ½ days. The body’s clocks can be altered by food, drink, drugs, and abnormal sleep. Biorhythms also influence the time and severity of illnesses and the effects of drugs. 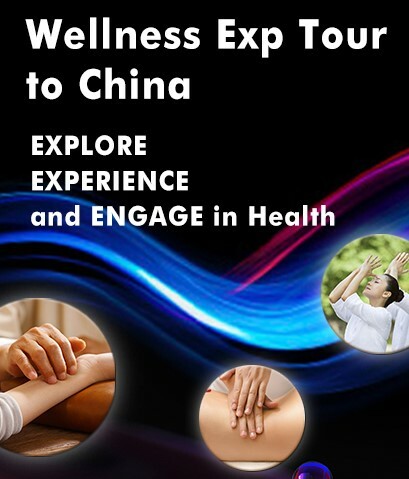 Therefore, herbal, qigong and acupuncture therapy can be prescribed at specific times to enhance their effect. Familiarity with the cycles of Heaven’s Qi enables the Qigong doctor to utilize it to regulate and balance the patient’s Qi. The Earth’s revolution about the sun causes seasonal energy changes in the organs and meridians of the body. In each of the 5 seasons a pair of organs reaches an energetic peak, as shown in Table1. The Earth’s revolution on its axis causes similar daily energetic maxima in the time period also shown in Table 1. 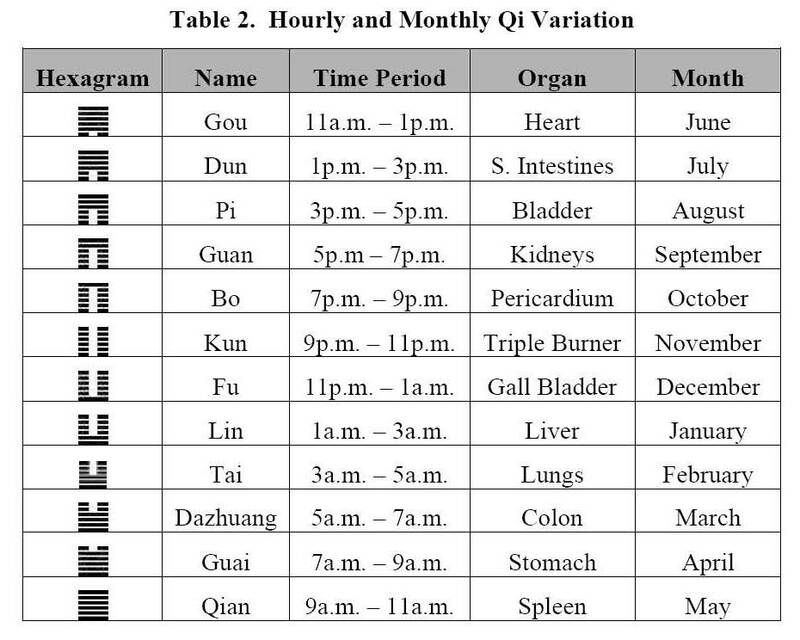 The daily cycle of Heat, Blood, and Qi flow along the body’s twelve Meridians, Organs, and Skin Zones according to two hour time periods appears in Table 2. For example, from 3 – 5a.m. maximum energy flows along the Lung meridian, making the Lungs more responsive to treatment. The fluctuations of Qi in Heaven and Man during the hours and months can be described by the Twelve Pi Hexagrams shown in Table 2. A hexagram consists of a horizontal stack of 6 Yao, a solid or broken line. A solid line represents Yang and also exhalation. A broken line represents Yin and inhalation. The hexagrams from Gou to Kun indicate the gradual increasing of Yin Qi and decreasing of Yang Qi. This time period is called the “time of dead breath”. 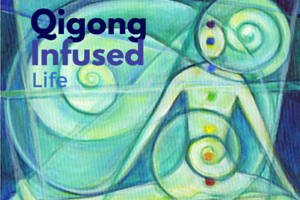 This is the best time for nurturing and restoring the Kidneys’ Yin Essence for people with deficient Yin Qi. The hexagrams from Fu to Qian represent the gradual increase of Yang Qi and the decrease in Yin Qi. This time period is called the “time of living breath”. 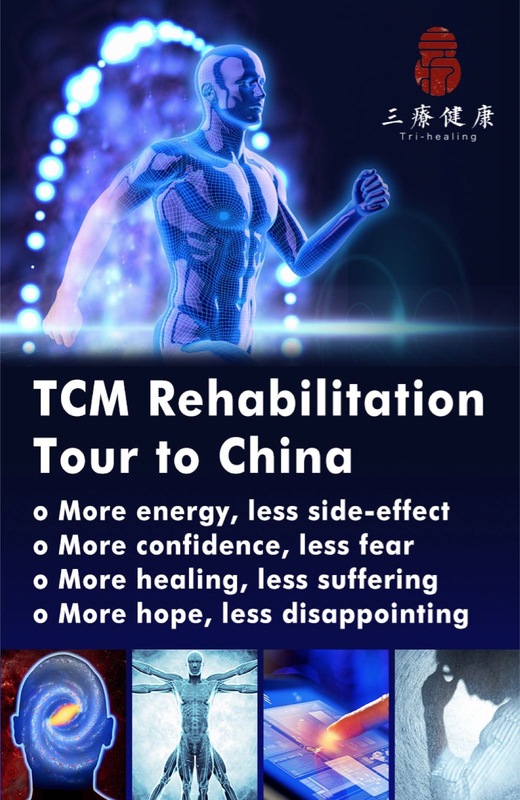 This is the best time for emitting external Qi and training for treating insufficiency of Yang Qi. A Qigong doctor can use the Yin and Yang Yao Cycles to prescribe for a patient by adjusting his breathing according to the applicable hexagram. For instance, when practicing during the period of the Fu hexagram, there is more Yin than Yang, so to nourish Yang requires longer inhalations (Yin) and shorter exhalations (Yang). The Gou hexagram shows that there is more Yang than Yin at this stage. To balance Yin and Yang, the practitioner should use shorter inhalations and longer exhalations during this time period. Practicing Qigong during the four following time periods aids increasing internal energy in harmony with the energy changes in nature. 2. The Dazhuang Period (Sunrise) is when natural Yang Qi increases due to the rising sun and so does the Yang Qi of the body. Practice during this period promotes the vigorous growth of Yang. 3. The Gou Period (High Noon) is when the Heart meridian exhibits its energetic peak. Since the Yang energy Yaos decrease, practicing during this period helps the growth of Yin energy and suppresses the hyperactivity of Yin energy. 4. The Guan Period (Sunset) is when the environmental energy changes from clear to dark. Practicing during this period encourages increasing primordial Yin Qi and the conservation and nourishment of Yang energy. The four seasonal peak transitions of energy, in the northern hemisphere, corresponding to the four time periods, appear in Table 3. Further seasonal transitions periods appear in (1). Ancient Qigong masters practiced Gathering the Sun’s Essence Meditation to gather pure Yang Qi and to strengthen Zheng (Gathering) Qi. This helped to eliminate pathogenic factors and prevent premature aging. Details can be found in (1). According to ancient Qigong masters, the sun has a Yang nature radiating hot, thermal energy, while the moon is Yin and emits a much cooler energy by reflecting the energy of the sun. The amount of energy reflected depends on the phase of the moon in its lunar cycle as it revolves around the earth. 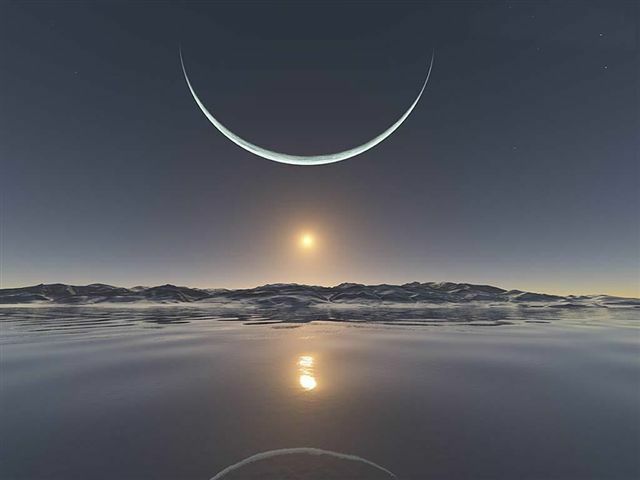 The lunar month begins with the new moon, when the moon is between the sun and earth. Sunlight strikes the half of the moon which is not visible from the earth and so no light is reflected towards the earth. When the moon travels about 1/8th of its orbit around the earth, the sun begins to illuminate part of the moon which reflects some light to the earth and the moon is called a waxing crescent After traveling ¼ of the way around its orbit the moon appears as a half illuminated circle. Some phases are shown in Table 4. The body’s Qi and Blood varies with the amount of reflected light and also with the gravitational pull of the sun and moon, just as the tides. Thus, the ancient Qigong masters specified times for tonifying and purging. For example don’t tonify when the moon is full since Blood and Qi are turning excessive due to the amount of reflected light and also because the sun’s and moon’s gravitational pulls are acting together in concert. 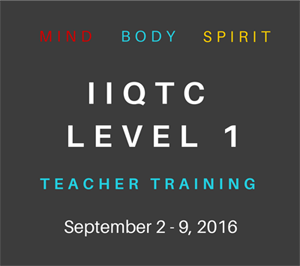 Table 4 helps in designing the proper Qigong treatment during certain phases of the moon. During a full moon, the body’s Blood and Qi fill the Baihui point at the top of the head. At the new moon, the body’s Blood and Qi gather at the Huiyin in the perineum. Following the moon’s cycle, the body’s Qi completes a full revolution, flowing up the Governing Vessel to the Baihui, and down the Conception Vessel to the Huiyin. Since the top and bottom o the Taiji Pole are activated at the full and new moon, these times are considered the most productive times for Taiji Pole Qi practice. Ancient Qigong masters also practiced Gathering the Moon’s Cream Meditation. The vital essence of the moon is called “Cream” or “cool light”. It is used to nourish the Kidneys, Jing, Marrow, and Brain, while contributing to longevity. This meditation is practiced only three days before, during, and after the full moon, a total of nine days. These days are the brightest days of the month. It is not practiced other days because there is insufficient vital moon essence to gather. This meditation is described in (1). The proper directions for practicing Qigong have been emphasized since ancient times (see Table 1). For instance, the practitioner faces the sun and moon when practicing sun and moon meditations. Patients with a Yang deficiency should face east or south. Those with Yin deficiencies should face north or west. Those with a Kidney, Liver, Heart, or Lung deficiency should face north, east, south, west, respectively. Patients with a spleen deficiency should focus their attention on the center (Earth). Note that although these directions are effective, a Qigong master chooses the place and direction using their intuition. They slowly turn until they feel their body filling with Qi in a specific direction. They cannot stand or sit comfortably unless they are facing that direction. This entry was posted in Scientific Qi Exploration and tagged five elements, forms of Qi, moon energy, Qi, Qigong, sun energy, yang, yin. Bookmark the permalink. A PDF version would be handy. Excellent – thank you for sharing your wisdom. All blessings to you. W.
Do you know who took that photo?? Any info would be helpful. Thank you!